Da Capo Lifelong Books, 9780738209043, 208pp. Whether you choose it or it is thrust upon you, change brings both opportunities and turmoil. Since Transitions was first published, this supportive guide has helped hundreds of thousands of readers cope with these issues by providing an elegantly simple yet profoundly insightful roadmap of the transition process. 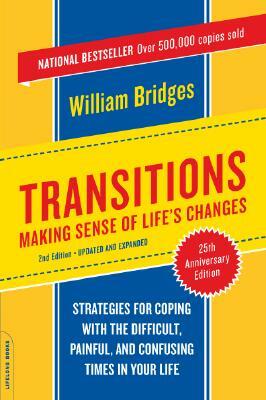 With the understanding born of both personal and professional experience, William Bridges takes readers step by step through the three stages of any transition: The Ending, The Neutral Zone, and, eventually, The New Beginning. Bridges explains how each stage can be understood and embraced, leading to meaningful and productive movement into a hopeful future. With a new introduction highlighting how the advice in the book continues to apply and is perhaps even more relevant today, and a new chapter devoted to change in the workplace, Transitions will remain the essential guide for coping with the one constant in life: change. Originally a professor of English, William Bridges made a shift to the field of transitional management in the mid-1970s; out of his workshops grew a long career of consulting, lecturing, and helping individuals and organizations through transitions. He was an internationally known speaker and author and a preeminent authority on change.